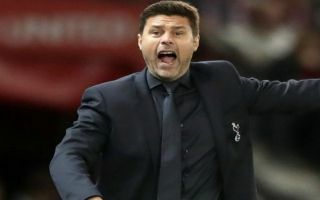 Tottenham boss Mauricio Pochettino was dressed in all black attire for tonight’s game against Manchester United, which fans have alluded to after the game. Spurs inflicted a second straight defeat on Mourinho’s side tonight at Old Trafford, winning 3-0 thanks to two goals from Lucas Moura and a Harry Kane opener. United also lost against Brighton in their last Premier League outing, which means they are now already six points off the pace at the top of the table. The Red Devils edged the game in the first half and should have gone in at the break one nil up, with Romelu Lukaku squandering a glorious opportunity by missing an open goal after taking the ball past Hugo Lloris in the Tottenham net. However, the second half was all Spurs as they raced into a two-goal lead before the hour mark, slicing United open at the back and showing off to the rest of the league their credentials as genuine title contenders this season. Mourinho’s men were outplayed once again and in the wake of this result, the Portuguese boss will no doubt come under even more scrutiny over his position at the club. Football fans on Twitter pointed to Pochettino’s choice of clothing in a jibe at the United boss, basically implying that his reign at the club is coming to an end after this latest result. Mourinho looking like a man taking his last bow, there. Good thing Pochettino came dressed for a funeral. It seems unlikely that this will be Mourinho’s final appearance in the dugout at Old Trafford but there is absolutely no doubt that all is not well at the club and the team is already facing an uphill battle in their pursuit of Premier League glory come May. Pochettino’s Tottenham, in stark contrast, will be buoyed by not just the result on Monday night but the second half display too, which underlined their attacking talents and highlighted the impact that Brazilian winger Luca Moura can have on the rest of their season.